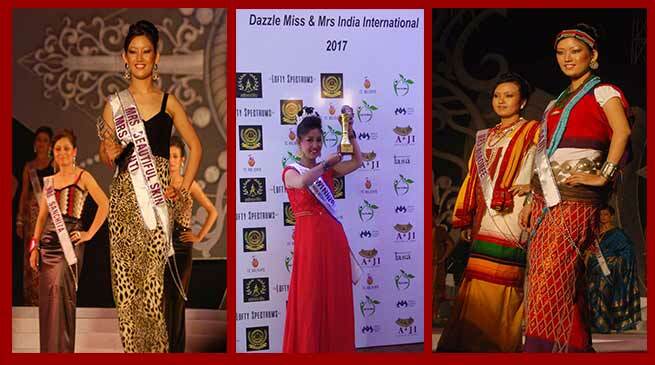 Biri Santi of Kra Daadi district of Arunachal Pradesh conferred with “Miss & Mrs India International-2017” along with a title ‘International looks face of North East of India” of which programme was held at Colombo on November 1 by Parisa Communications Dazzle groups in association with Ministry of Tourism, Government of Srilanka. Santi born on 9th Dec 1989 at Palin, Kra Dadi District, Arunachal Pradesh, presently lives at New Delhi. Married to Nido Jose Apil and has a son Nido Alex. She also represented Arunachal Pradesh earlier and won a Title of Darpan ‘Mrs beautiful Skin’ at Mrs India North East in 2010 at Guwahati, Assam. She’s a Home maker and a philanthropist, loves music, dancing & singing. Santi while talking to this daily said that she is very happy to represent the nation being Arunahalee and resident from far Palin in Kra Daadi district. She said that it is happy moment for me to received such award in foreign land. She said that she have also participated in a video album ‘Dil se kashmir’ for promotion of Jammu and Kashmir Tourism with Bollywood superstar Amitab Bachan and recently Government of India Health Insurance. And shooting of GOI for state for Adhar Card and represented Arunachal Pradesh. Santi in her message to the younger’s said that dedication and hard labour will bring fruit and appeal the younger’s to carry out all works sincerely with dedication and devotion and success will naturally reach. Leader of Opposition and PPA and Palin MLA Takam Pario in a message to Arunachal24 said that people of state in general and 18 Palin Assembly Constituency is happy to know that Biri Santi have received such a name and fame representing the country on behalf of the people of Arunachal Pradesh. Pario congratulating Biri Santi Nido on her conferment of such a reorganisation of international forum and appreciated her effort in the hope that the youngsters may follow her. Dear didi shanti im happy to know that you did it…And also happy to know that every body will know that our BIRI clan is much better than other…clan…congratulation..didi…and carry on..